"Why I Hate Religion, But Love Jesus"
This is a video that went viral since it's release on January last year. According to Wikipedia, as of February 18, 2013, 10:30 EST, the video had 23,979,934 views on YouTube. 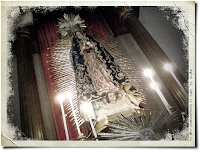 And I think today, Black Saturday, is a good time to share this video here in my blog. 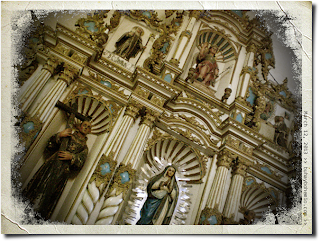 This poem by Jefferson Bethke calls us to reflect on the difference between following Jesus and following organized belief and culture systems. 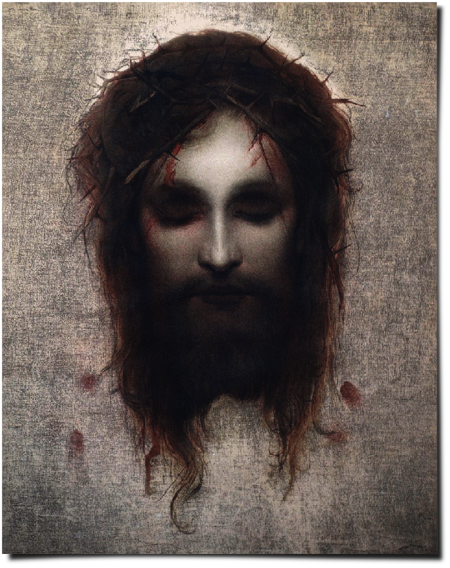 This image of Jesus is from a painting by Austrian artist Gabriel von Max (1840-1915) entitled Jesus Christus, which is styled to look like the impression of Christ's face on St. Veronica's veil (or handkerchief ) after she used it to wipe His face while carrying the cross to Calvary. This is actually one of my favorite paintings of Jesus because of it being dark. It's a dark portrait of Christ during His darkest moments. 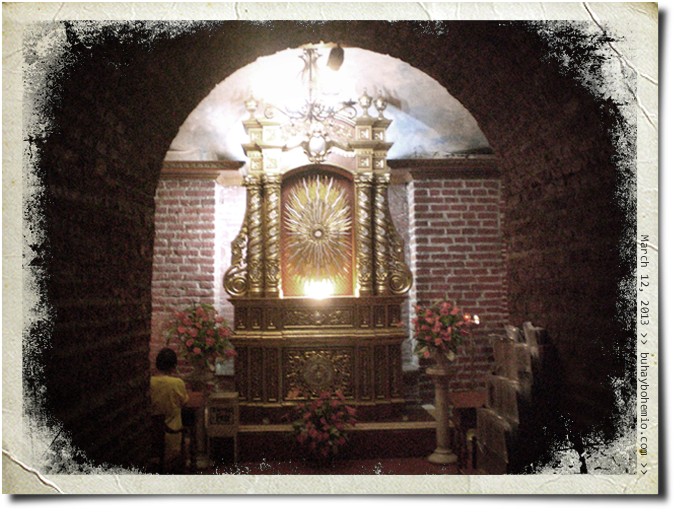 And by those dark moments He gave us the light of salvation. 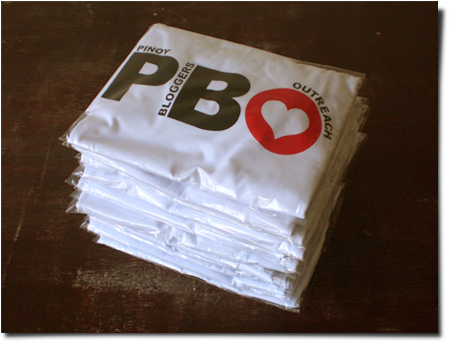 Today I printed 14 more pieces of this Pinoy Bloggers Outreach shirt. 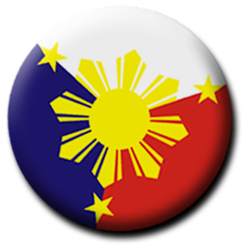 It's good to know that the blogger group will be reaching out again to the less fortunate Pinoys, and this time with 14 more volunteers. 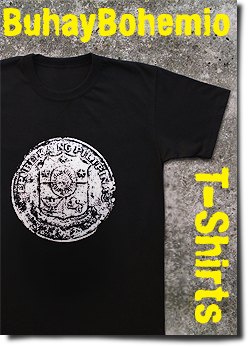 The first batch of shirts are for 25 people. Their first outreach program was at the White Cross Children's Home last January. 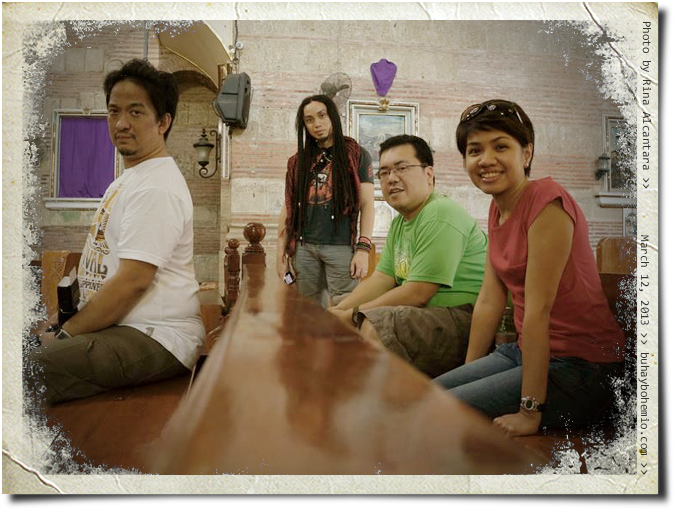 Their next will be at the Bahay ni Maria, a shelter for abandoned elderly people and children, this Saturday, March 30, 2013. 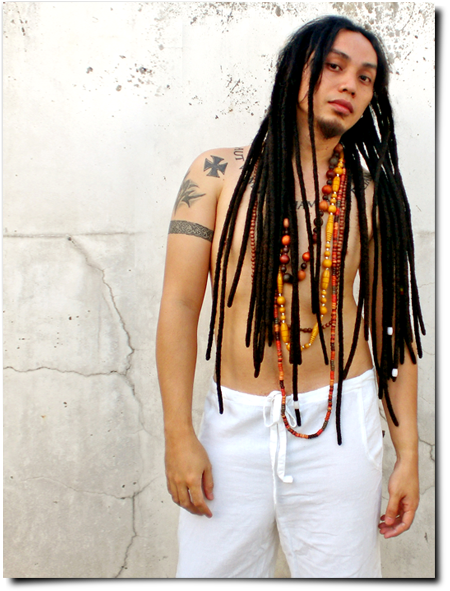 I hoped to be commissioned for contemporary style portraits and last month I got this project. They are for my client's two daughters and they are styled to compliment the interior of their bedrooms. 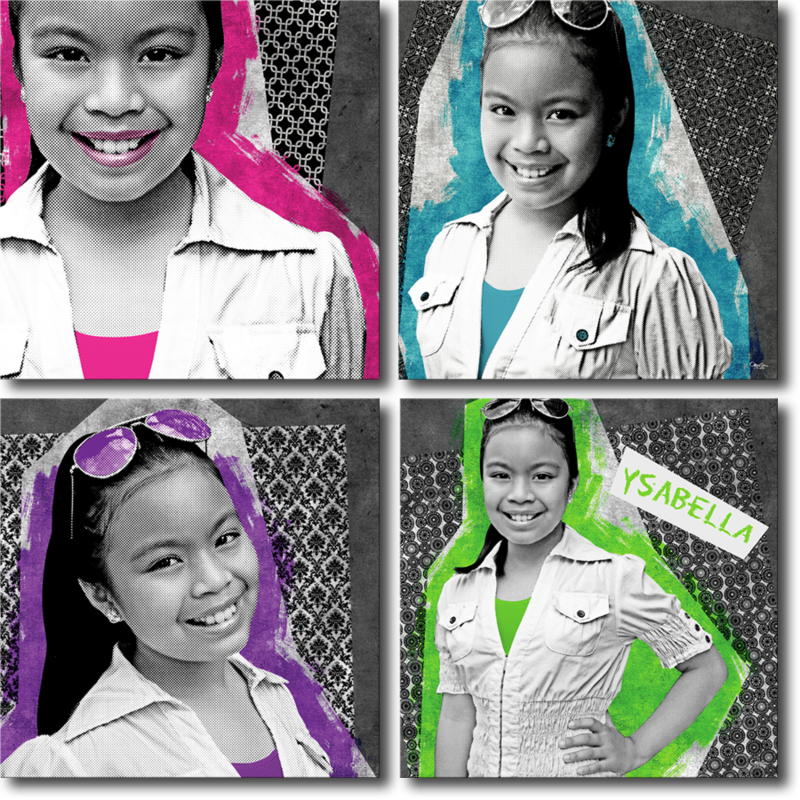 For Ysabella, a 4-piece set of 20"x20" canvas prints. 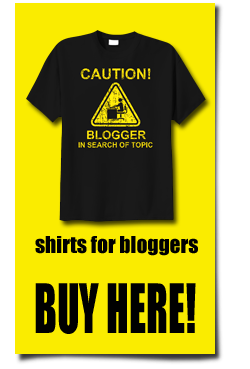 Her room has a motif of black and white with accents of magenta, turquoise, purple and apple green. On her pop art style portrait I used halftone dots, different black and white patterns, and used real paint on the accent colors. For Ylisse, a large canvas print of 45"x 35" and this is so far the largest artwork I've done for a portrait. 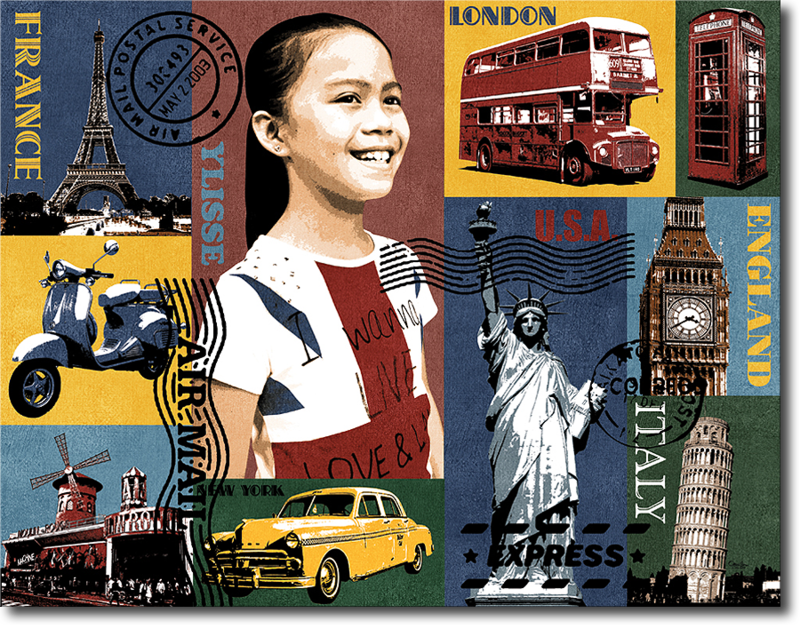 Her room has a nice world travel theme. The project started mid February and I've just delivered everything last Saturday (23rd March). 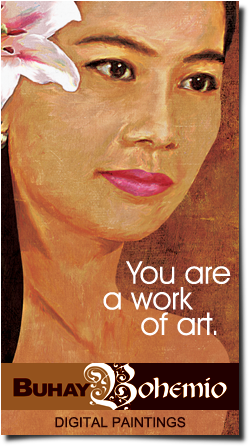 The artworks of course went through a series of revisions and approvals. And I had trouble with the discrepancy between the actual print and the file (as seen through a monitor). Usually the differences are tolerable but in this project, by its style, the discrepancy was too conspicuous. Like Ylisse's artwork came out too saturated on the first print which doesn't compliment the sedate colors of her room. With Ysabella's, one panel was printed first for approval and when the other 3 panels were printed their grays came out with a bluish tint. Yup! The guitar that I've been meaning to buy - here it is! 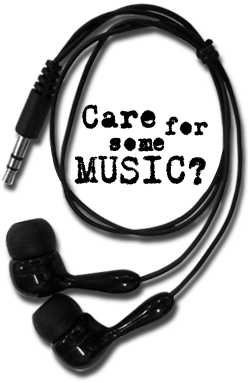 It's an Ibanez AW300ECE. It has a built in pick-up, nice chestnut color and inlaid with abalone shell. Finally a better sounding guitar than my previous one that I sold off. 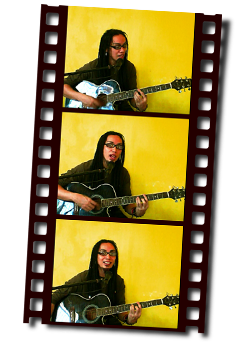 It's bigger and heavier and I realize that these factors contribute to a fuller guitar sound. 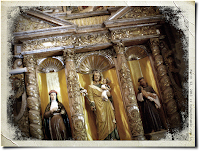 A body that is made of solid wood effectively transmit vibration than plywood - and solid wood of course is heavier. 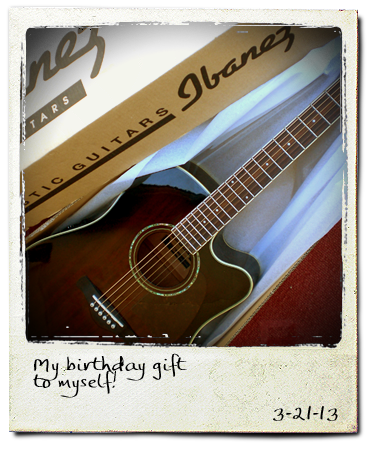 My new guitar is kept in it's box. I don't hang it or put it on a guitar stand as an anti-procrastination measure hehe. I need to get some stuff done and the sight of this beautiful instrument is like saying, "play me! play me!" 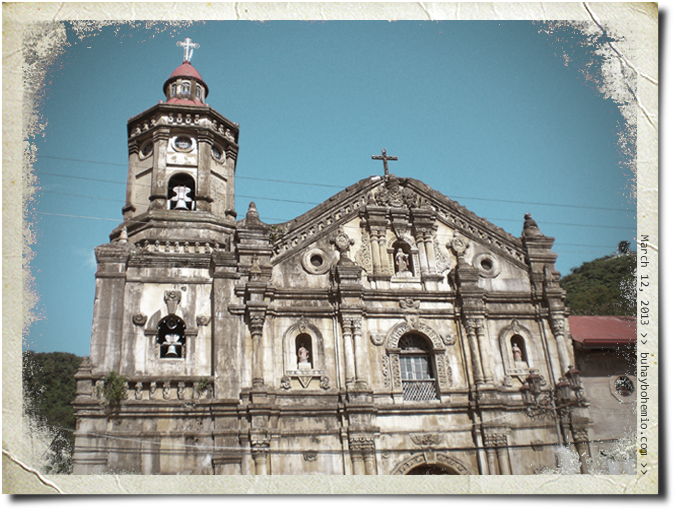 Pagsanjan Church doesn't really look old as the other churches we visited in Rizal and Laguna. The current structure was probably built after WW2. But the original stone church dates back from 1872. 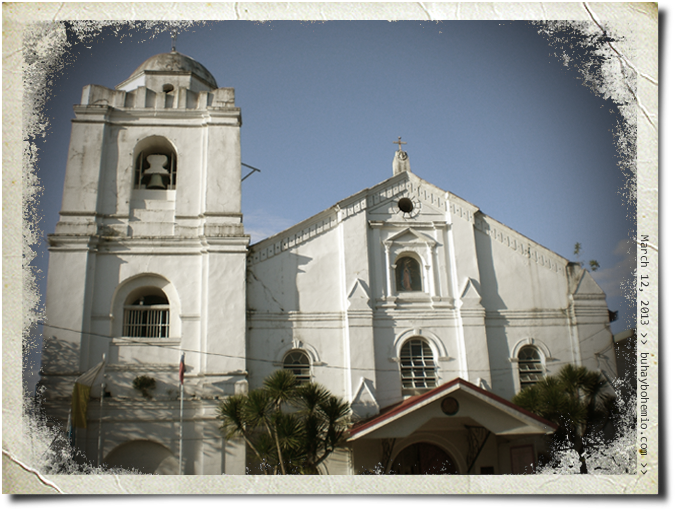 Pagsanjan Church is also known as the Our Lady of Guadalupe Church in Laguna. Of course the interior looks very much from our time. No more baroque style retablos. 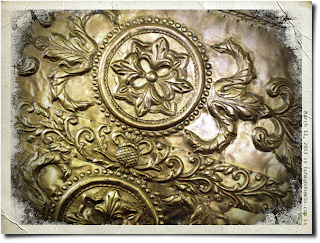 The altarpiece is clad with these nice hand-tooled brass panels. 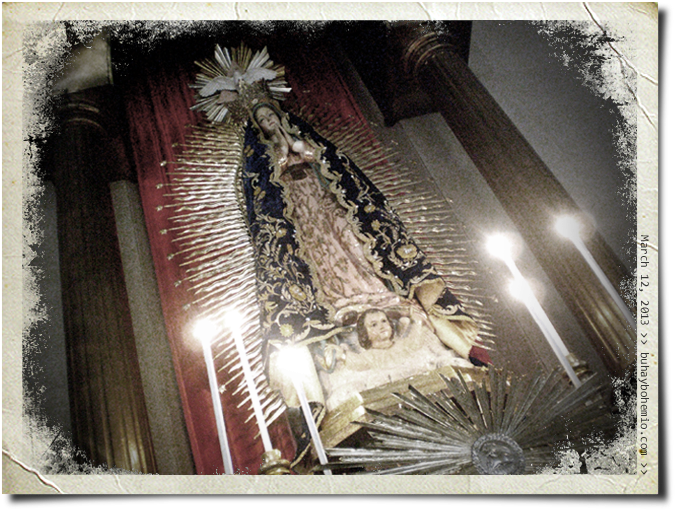 A magnificent life-size statue of Our Lady of Guadalupe. Behind the altar is an access to where a devotee can touch the image and say a prayer. 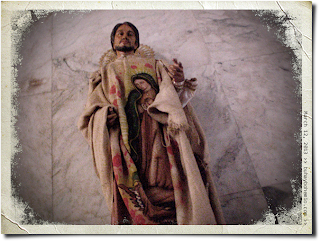 A life-like statue of San Juan Diego wearing his tilma that was miraculously imprinted with the image of the Blessed Virgin in the likeness of how she appeared to him on Tepeyac Hill, Mexico in 1531. 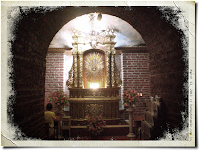 Within the church complex is this old chapel that is said to be part of the original stone church of Pagsanjan. 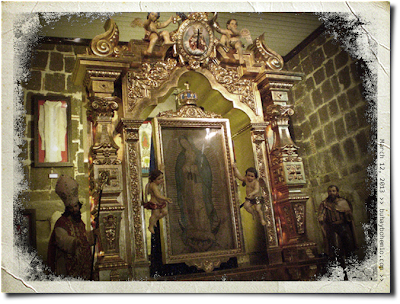 Here you will find an elaborate baroque style altarpiece showing a replica of the tilma that is imprinted with the image of the Lady of Guadalupe. 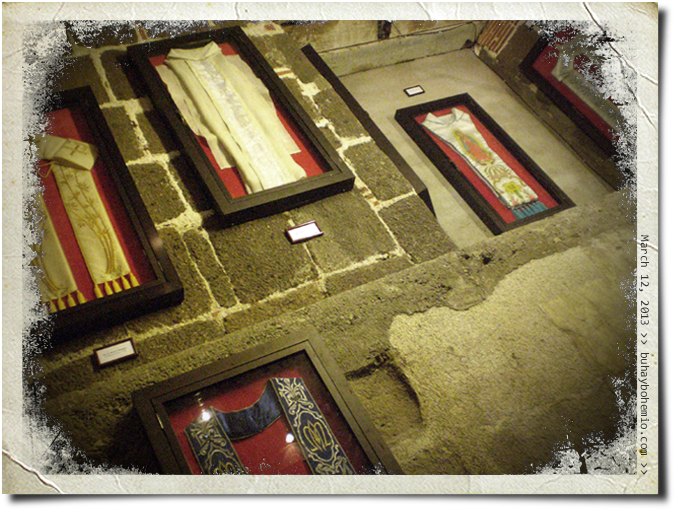 Behind the altarpiece is this display ceremonial vestments of priests that's probably from the 18th century. 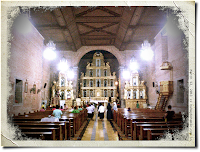 Coming up: the last Church we visited in Laguna. 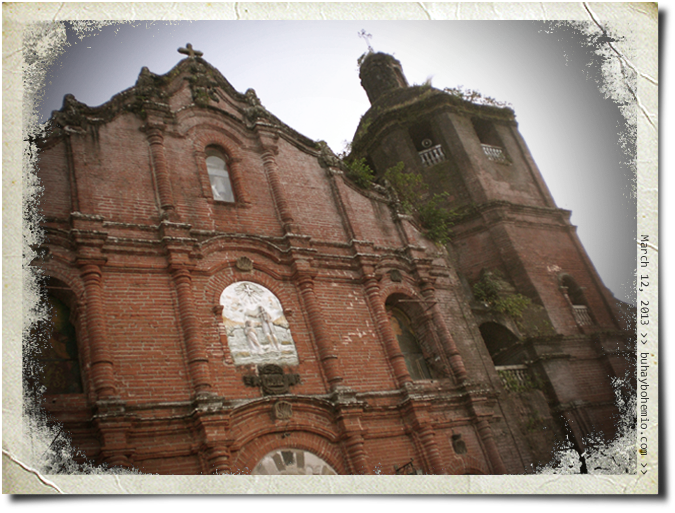 Paete Church in the province of Rizal is also known as St. James the Apostle Church and this is the 5th church that we visited last Tuesday. 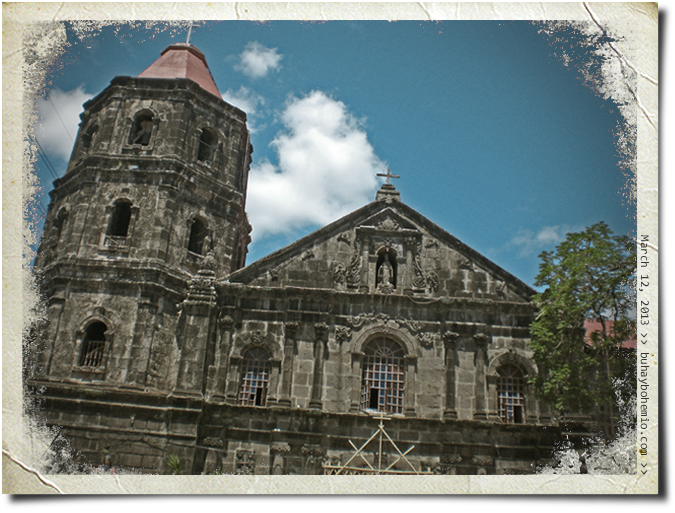 It is another old church that has had its share of being destroyed, rebuilt and destroyed again. 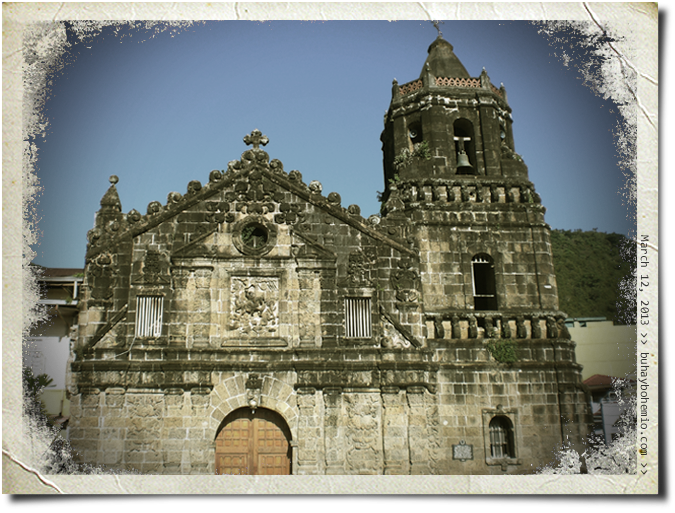 The original stone structure was built in 1646. 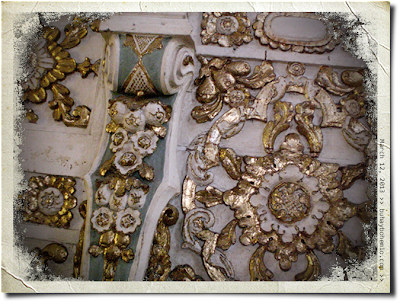 The present structure was built in 1884. The color of wood and adobe somehow gives the interior a sedating effect . 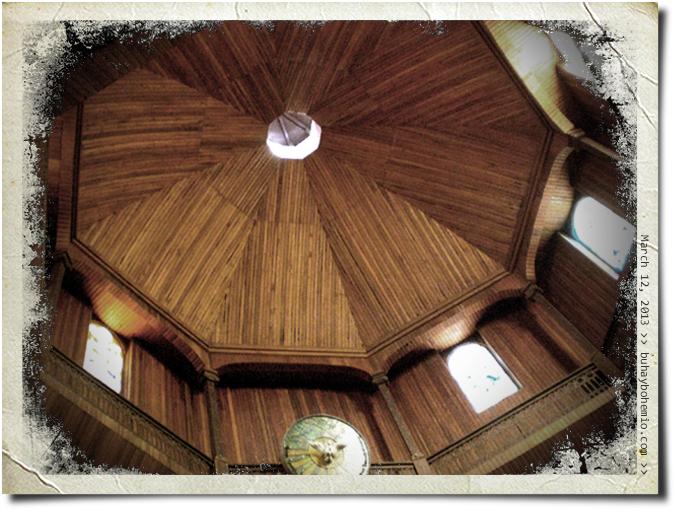 The octagonal dome ceiling made of tongue-and-groove planks. 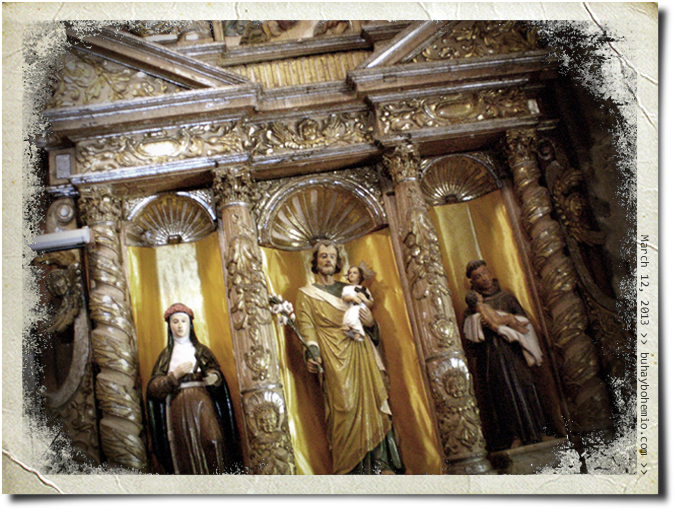 The main retablo with a finish of natural wood with gilded accents. 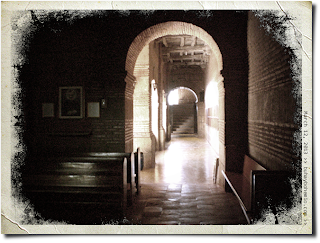 It was pretty dark in the church when we got there. 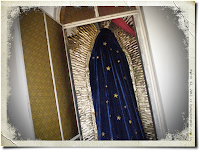 The administration closes the church when not in use to safeguard the items inside. 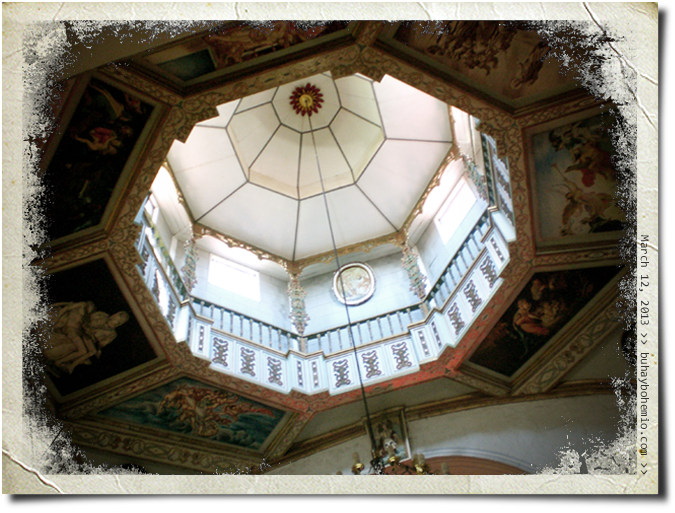 But they are kind enough to let us in and take some pictures. The retablo at the right transept. I just love the sedate colors. 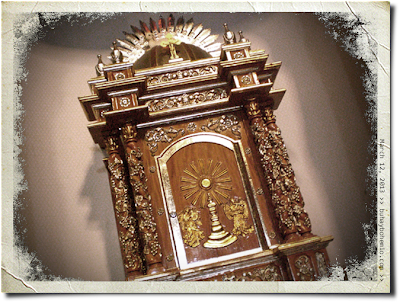 You can see the remarkable craftsmanship of Paete woodcarvers on this tabernacle. 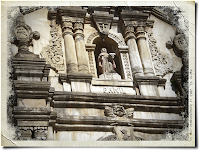 Paete is after all the Carving Capital of the Philippines. 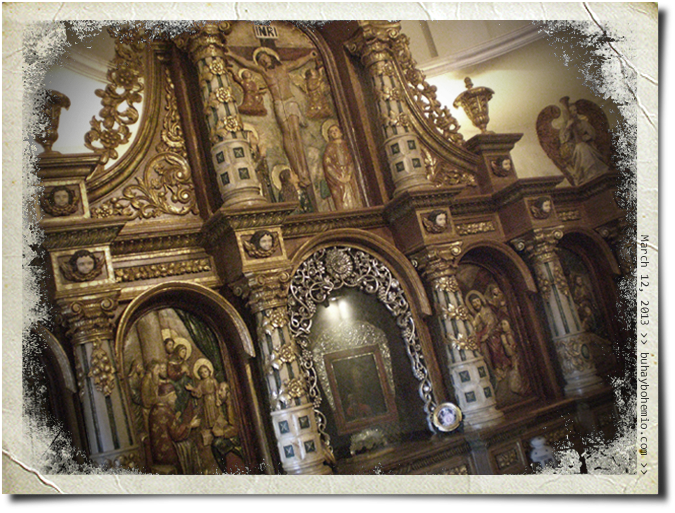 Inside the church are three real big paintings. 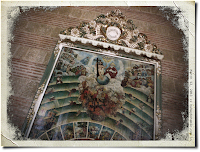 Because it was too dark inside the church I was only able to photograph this painting of St. Christopher, thanks to the light from a window on the opposite wall. 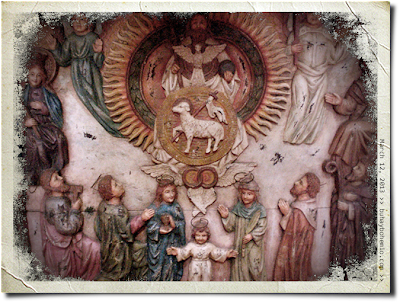 Christopher, my name, means "bearer or Christ". 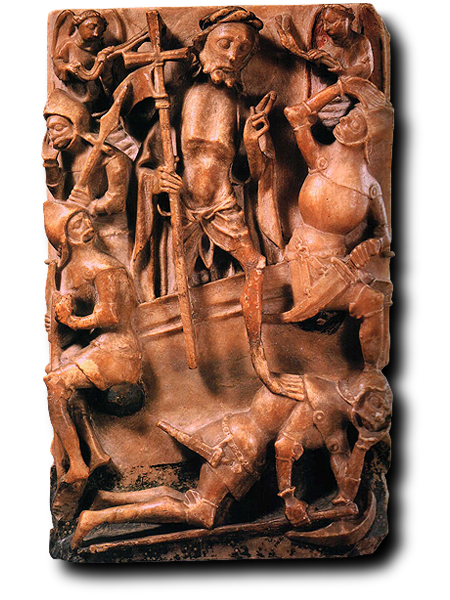 The Saint was a 7.5 foot Canaanite from the 3rd Century who carried Christ, disguised as a child, across a dangerous river. 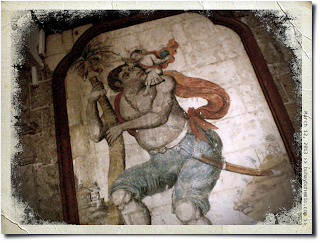 Read about the legend of St. Christopher here. The 4th church that we visited last Tuesday (March 12, 2013) was the first church in Laguna that we stepped into. 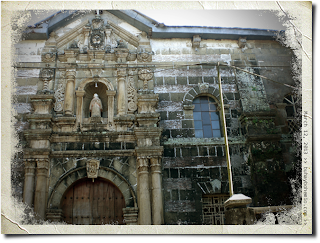 The old church of the municipality of Pakil is also known as the Lady of Turumba Church. 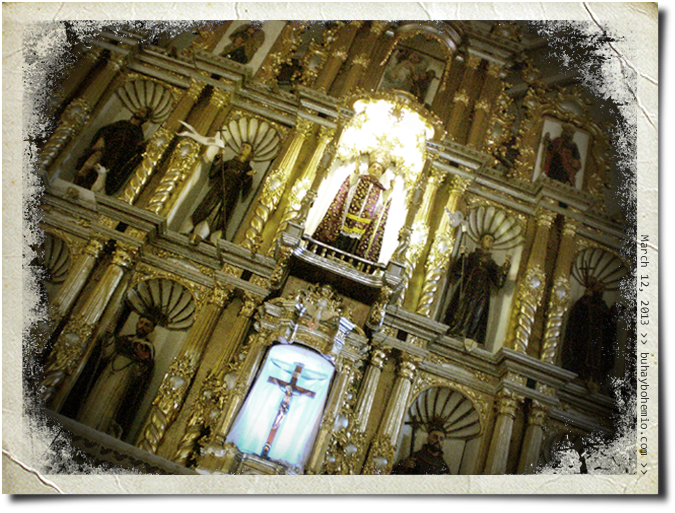 It has a history destruction and reconstruction. 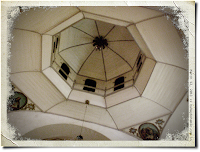 The original stone structure was completed in 1732. 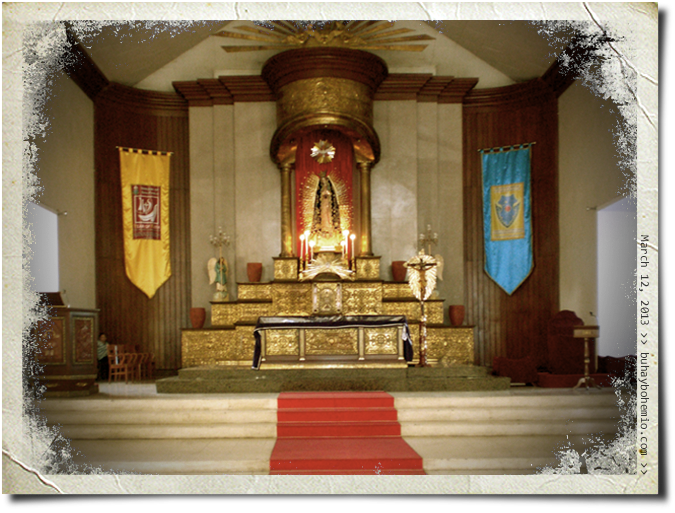 Of all the churches I visited in this trip, this is my favorite. Detail from the facade of the Pakil Church. 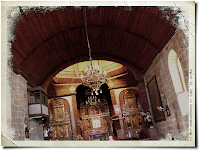 The left side of the church. I just love striped walls of adobe and bricks. The beautiful interior. 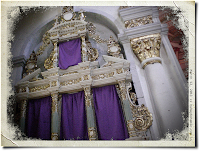 The church practices the custom of covering the images of the saints with purple fabric during the Lenten season. Finally a ceiling with paintings. The paintings show familiar religious images of the world, like Bernini's Pieta and scenes from the ceiling of the Sistine Chapel. 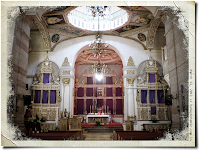 creates a pinkish glow on the apse ceiling. 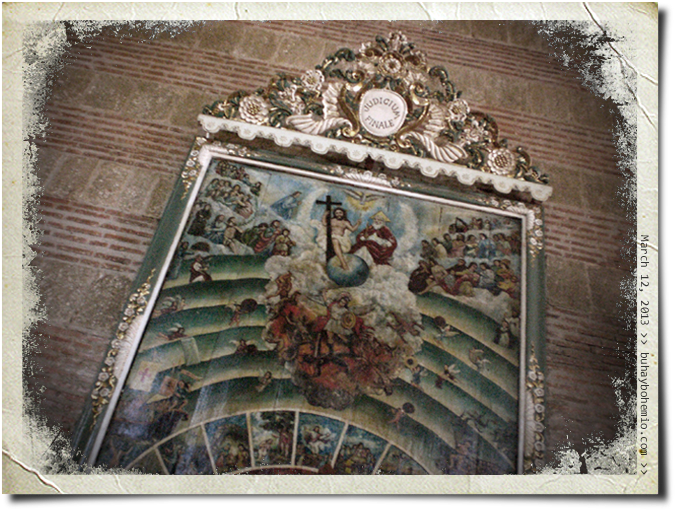 This large artwork, painted on a row of wood planks, hangs at the right side of the church. 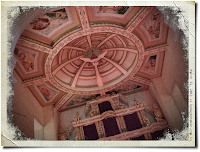 Entitled Judicium Finale or Last Judgement. The retablo on the left transept. Would have been great to see the collection of statues behind the purple covers. 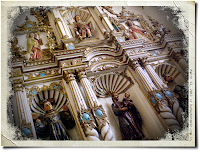 Detail of one of the retablos. 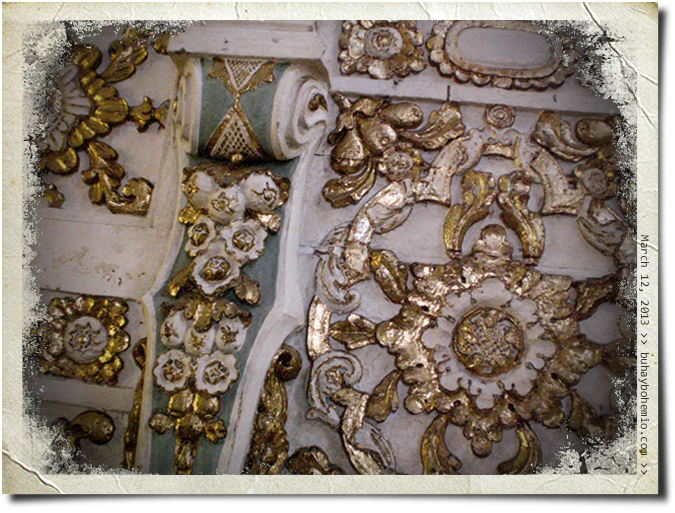 Same colors as those in Tanay Church, only the gold parts are gilded. 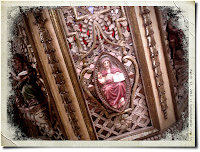 Detail of the right hand pulpit from the altar. 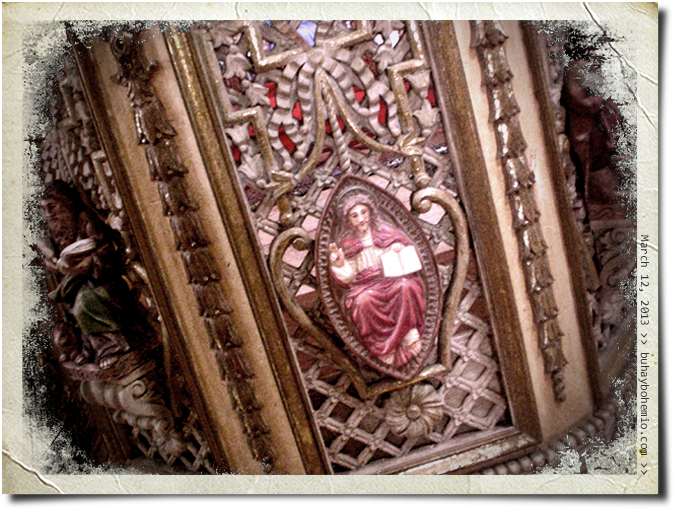 Detail of the left hand pulpit from the altar. 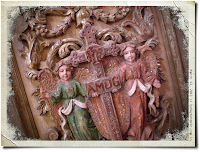 Detail at the bottom of the altar. It may have been done by a woodcarver from Paete, another municipality in Laguna known for such craftsmanship. 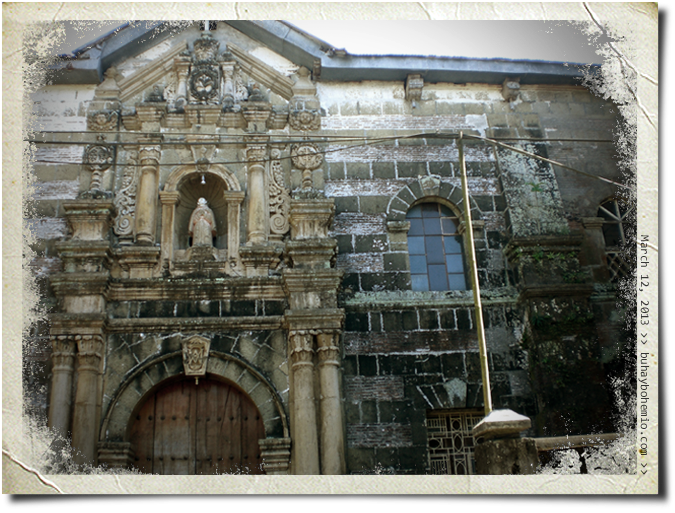 The reason why this church is my favorite among those I visited here, aside from its oldness and impressive carvings, is because of the story of the Lady of Turumba. This hall adjacent to the convent will lead you to a gallery of information about the miraculous image. The altarpiece that displays the small painting of the Lady of Turumba that is more than 2 centuries old. Unfortunately the reflection on the glass and the low light prevented me from getting a good photo of the painting. 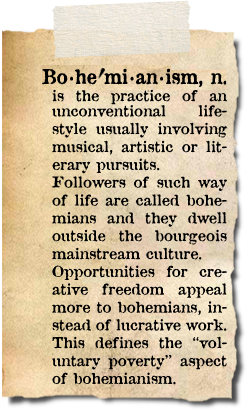 See a better pic here. 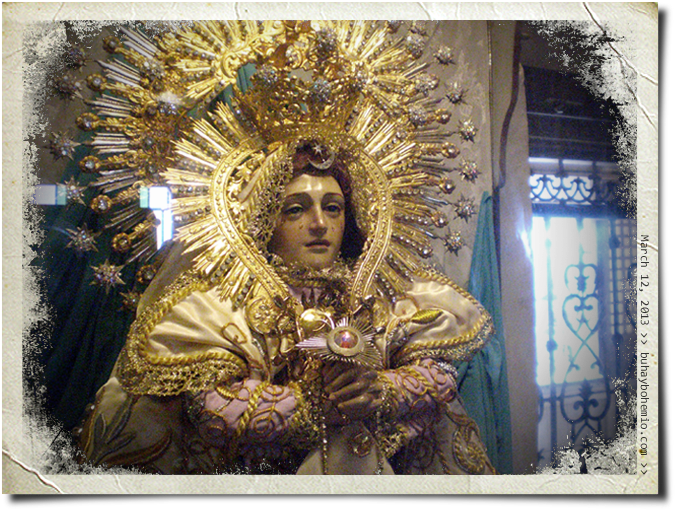 Learn about the story of the image and the very old seven-day festival known as the Turumba here. 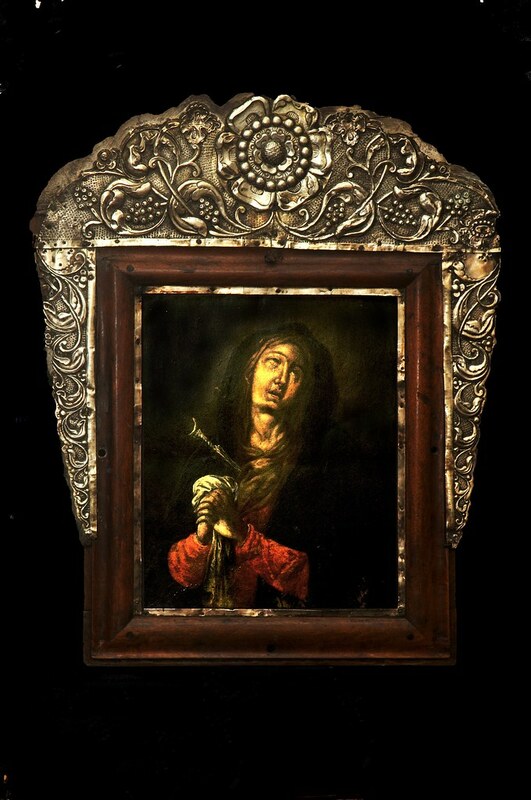 The Lady of Turumba painting depicts a sorrowful Blessed Virgin. 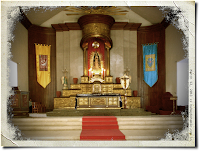 It is too small to be seen among a crowd of devotees. 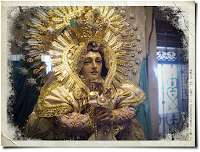 So a statue of the Nuestra Señora de las Antiguas, a replica of that in Spain, is also used in the processions of the Turumba Festival. 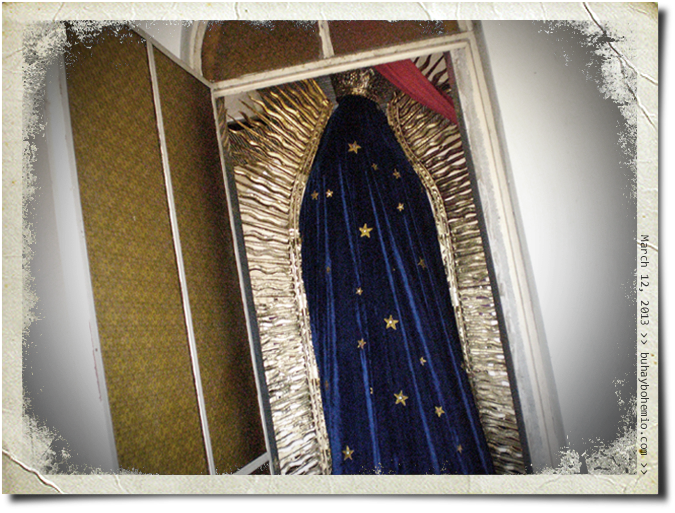 Our replica of Our Lady of Sorrows has her own wardrobe. 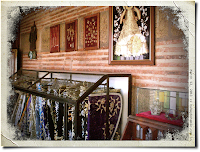 This room stores her clothes, jewelry and perfume. All of which are donated by devotees. 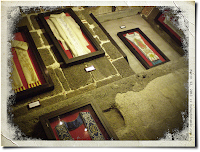 Her worn out vestments are cut into small pieces and are given to devotees who seek protection, especially when traveling. 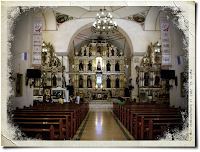 The third church we visited is located in the municipality of Tanay. 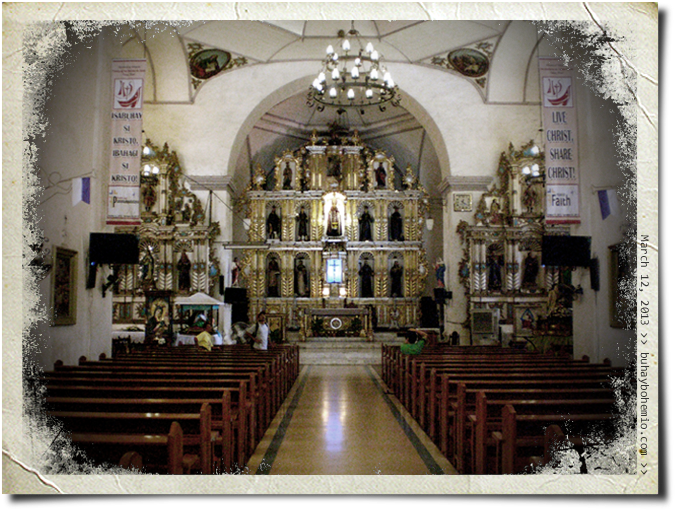 It is also known as the San Ildefonso Parish Church. The present structure was completed in 1783. 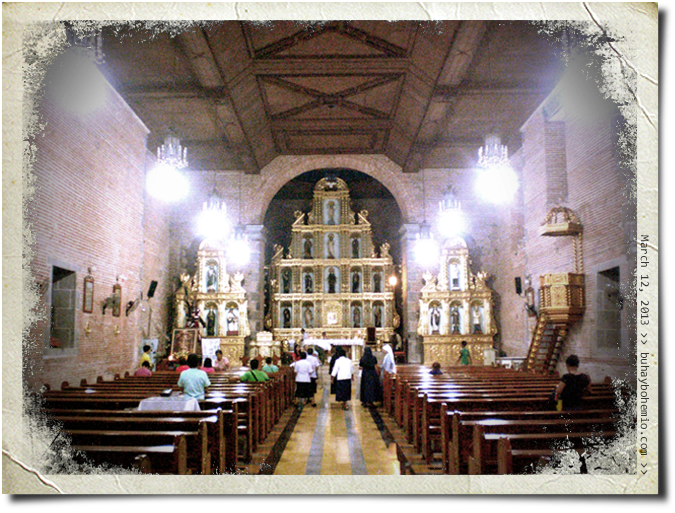 Compared to the first two churches that we visited in Rizal, for me this one has a better interior. The retablo (altarpiece) behind the altar is really awesome. 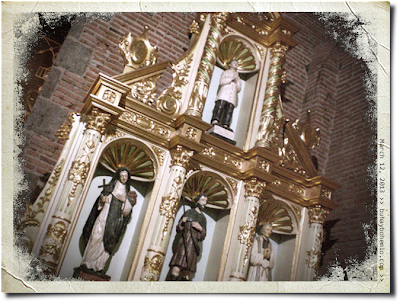 At the center is a statue of St. Ildephonsus. 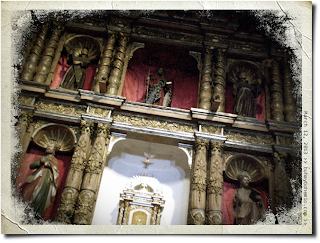 The saint is from the 7th Century, was archbishop of Toledo, Spain, and is a theological writer. 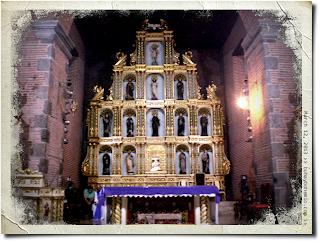 The retablo at the left transept looks real elegant in white and gold paint, with accents of turquoise blue. The retablo at the right transept. 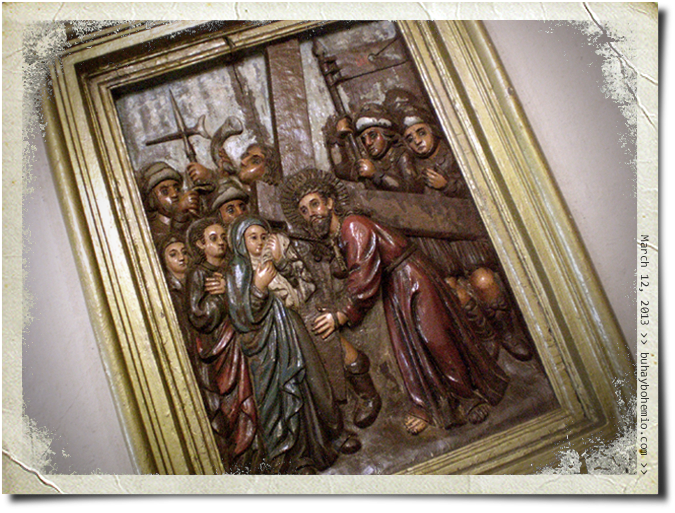 Their Via Crucis relief sculptures are real cool. They seem to be as old as the church itself. 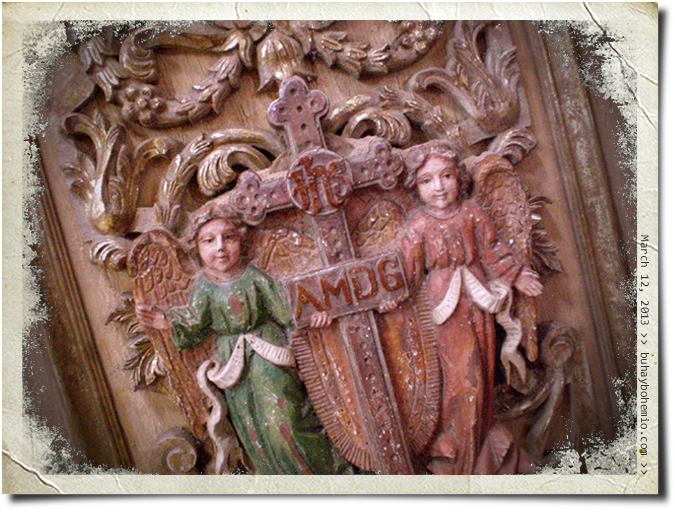 Each is made from one large plank of wood. The frame is made of concrete that is fixed on the wall.